Space Makers Sheds provides premium-quality sheds and outdoor structures from our store in Bear, DE. We specialize in outdoor storage buildings, gazebos, and outdoor furniture & decorations. Our products are Amish-built in nearby Lancaster County, Pennsylvania using premium building materials. We provide nationwide delivery on all buildings and furniture, and we can even help you with setup. If you are looking for Amish-built sheds and patio furniture right here in Delaware, stop by Space Makers Sheds. A family-owned business since 2005, Space Makers Sheds is owned and operated by Sam Glick. Growing up in Lancaster County, Pennsylvania, Sam experienced firsthand the craft of building sheds by hand. His dad started building and selling storage buildings when Sam was 5 years old, and this is where Sam learned the value of hard work, quality material, and handmade building techniques. With the store on Pulaski Highway, Sam loves being able to serve customers directly. Through this location, Sam and the Space Makers team can help customers dream and design the outdoor living space they’ve always wanted. We provide everything you need to complete your home’s backyard. Increase your storage space with a shed, garage, or barn. Add a comfortable, relaxing space with a gazebo, pergola, pavilion, or cabana. Find the right picnic table, rocker, or outdoor furniture for your patio or porch. And our playhouses, lighthouses, and weathervanes provide the perfect finishing touch to your outdoor living space. Don’t see what you like? We can customize any order to fit your needs. We can even custom build a structure to match your style and wishes. And all our structures can be modified to match your existing home exterior. Nationwide delivery is available, and we will setup your new shed and remove the old structure for you. 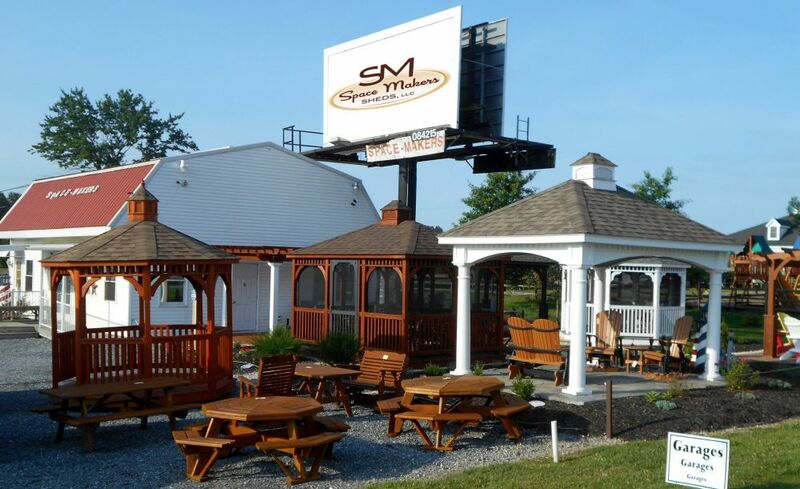 Our retail store and outdoor showroom is located on Pulaski Highway in Bear, Delaware. We are right off Exit 160 on Route 1, and close to Christiana, New Castle, and Wilmington. We are easily accessible by I-95, I-295, I-495, and the Delaware Memorial Bridge. Visit our outdoor showroom and you can buy a pre-built outdoor structure right off our sales lot. If you’d like a custom structure, we can help you design it and order it that day. Our custom sheds are handcrafted in Lancaster County, and we will deliver it directly to your property. We're located 1/2 mile west of the 13/40 split.